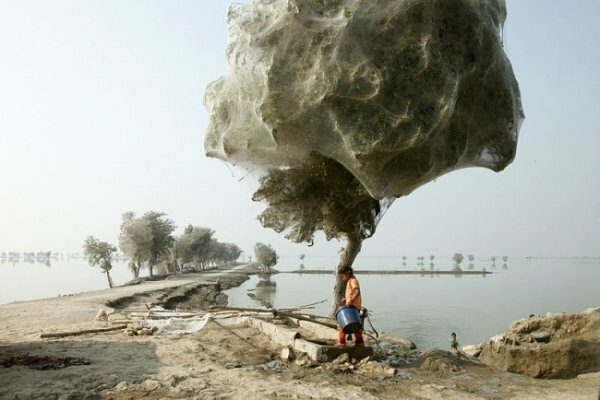 Spider webs: In the aftermath of a particularly heavy flood in Pakistan, spiders retreated to the safe high ground of trees to build their webs. 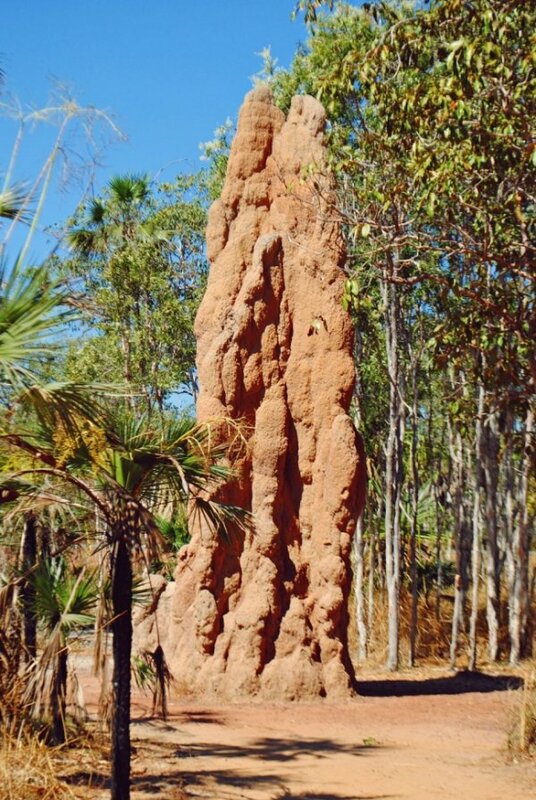 Cathedral Termite Mound found in Litchfield NP, Australia. 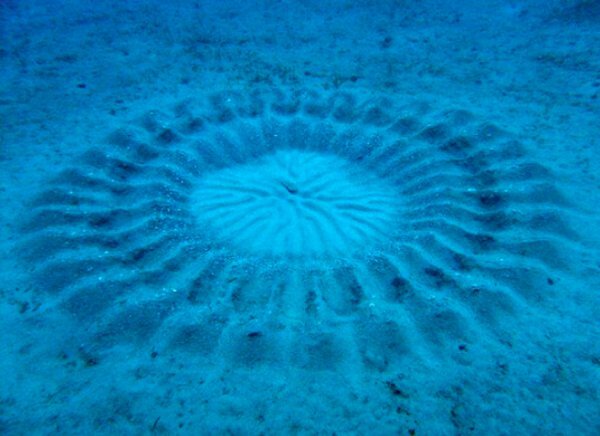 Pufferfish circles: Male pufferfish make these on the ocean floor by flapping their fins and swimming in circles. 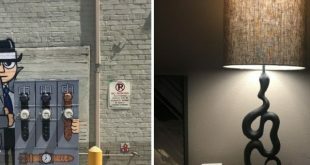 The goal of the artwork is to attract a female. 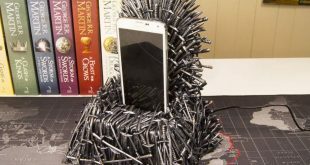 The more complex the pattern, the better his chances of mating. 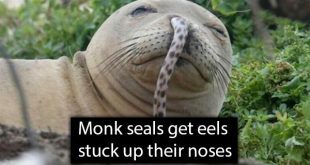 This whole situation is an adorable Pixar film just begging to be made. 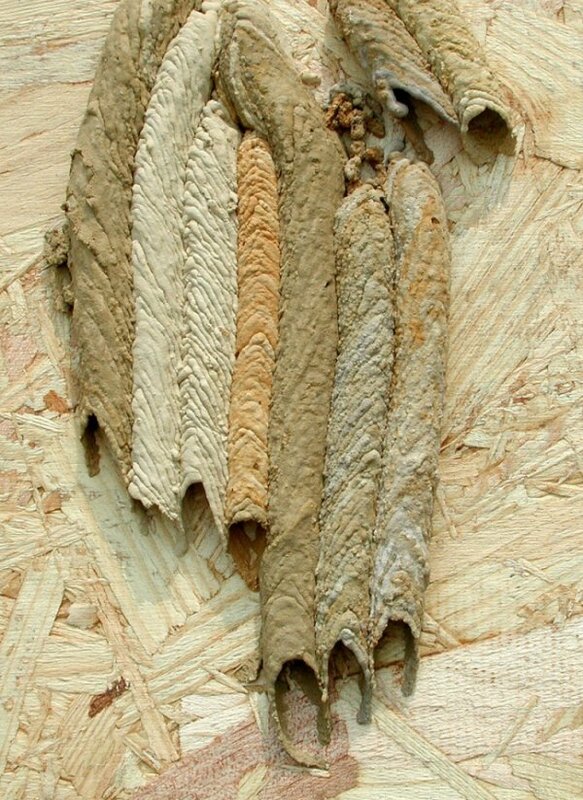 Paper Wasp Nest: These wasps use thin wood fibers to make their nests. 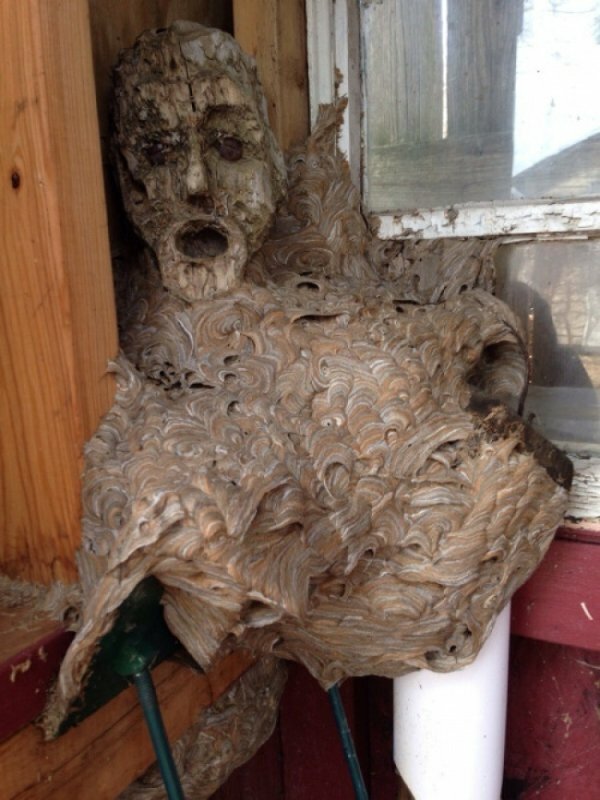 This one molded to a statue in a garage, creating a chilling effect. 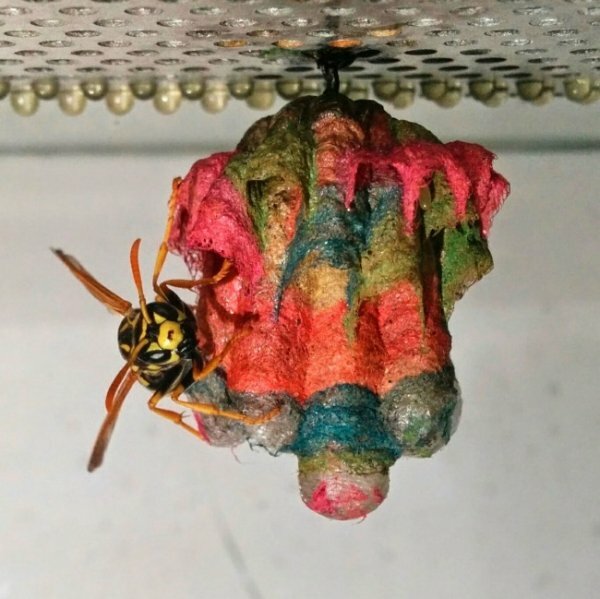 Paper Wasp Nest: these paper wasps used colored paper. 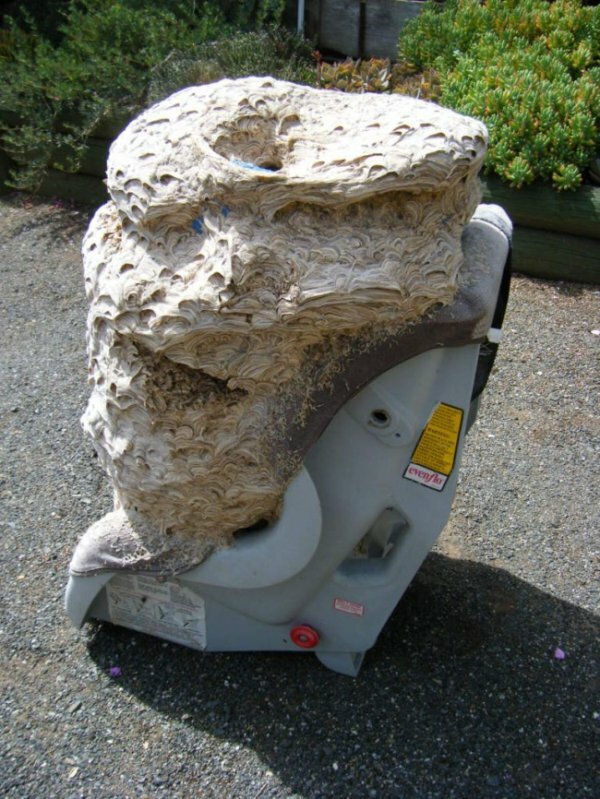 Paper Wasp: And these used an old child’s car seat. 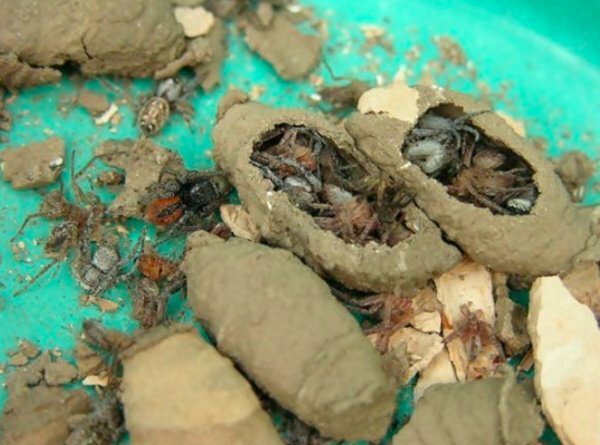 Mud Dauber Prisons: Mud Daubers paralyze spiders, flies, and butterflies, then trap them in a mud cocoon with their larvae. 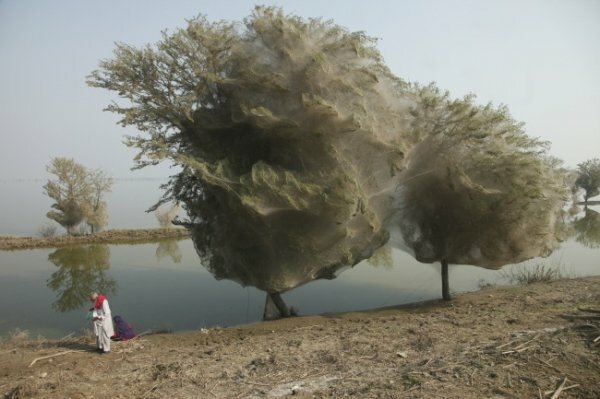 When the larvae hatch, they have a fresh meal. 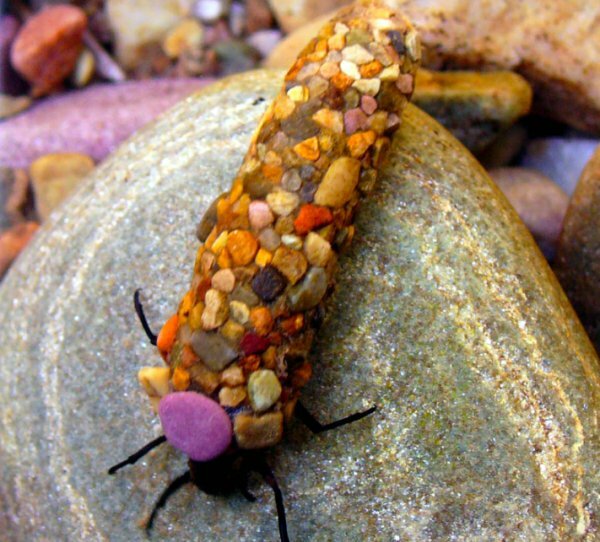 Caddisfly Larvae: these insects cover themselves in stones, shells, weeds, and mud to armor themselves from predators. 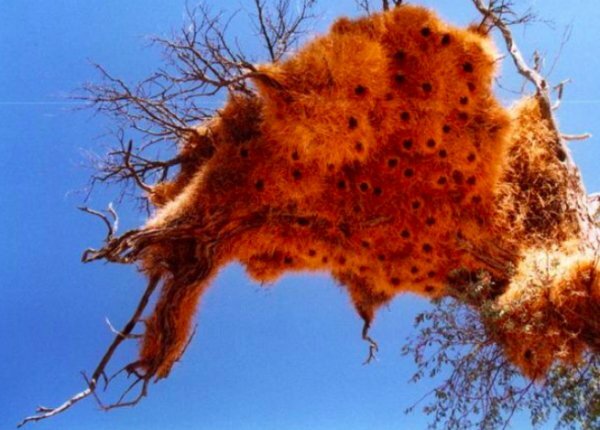 Weaver Bird Nests: These giant, basket-like condominiums house a colony of weaver birds for generations, and have been known to grow so large that trees snap under their weight. 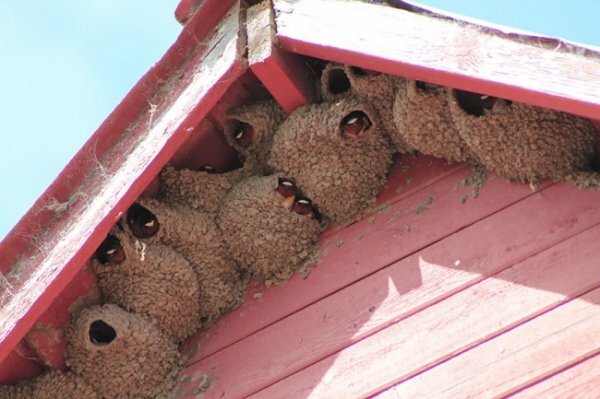 Swallow Nests: Swallow birds build hundred of neat little nests in clusters. 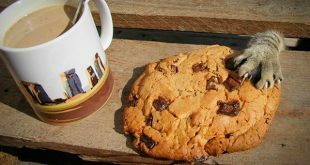 The nests, made of mud and the birds’ saliva, are a pricey delicacy in China, India, and Indonesia. 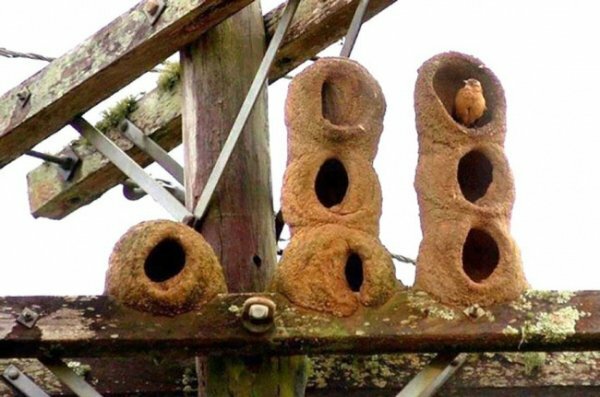 Red Ovenbird Nests: These nests, made of mud, clay, and grass, can take the red ovenbird around 2,000 flights back and forth to collect the necessary materials. 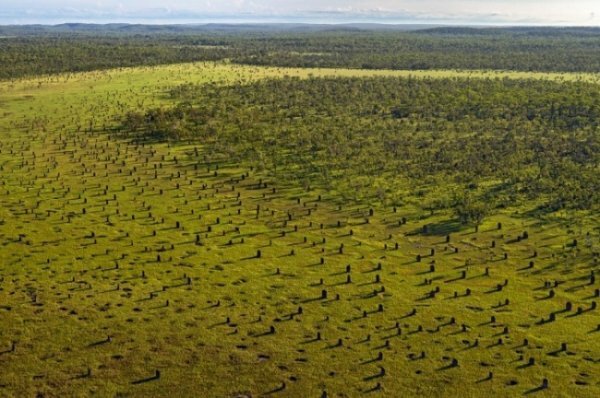 Compass Termite Wedges: These structures stand at around 10 feet tall and house 2 to 3 million termites. 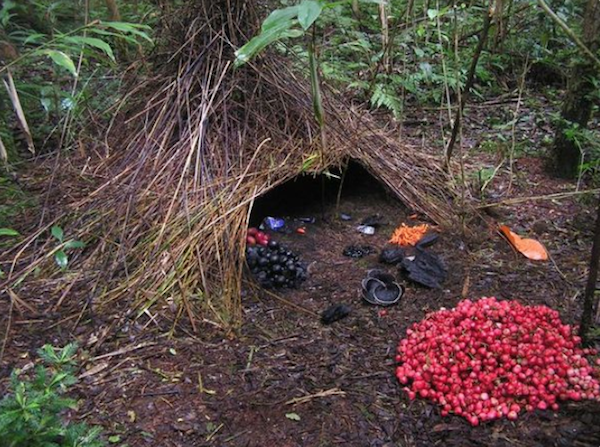 Bowerbird Bower: These birds find berries, beetles, flowers, and other colorful things to decorate their bowers and attract a female. 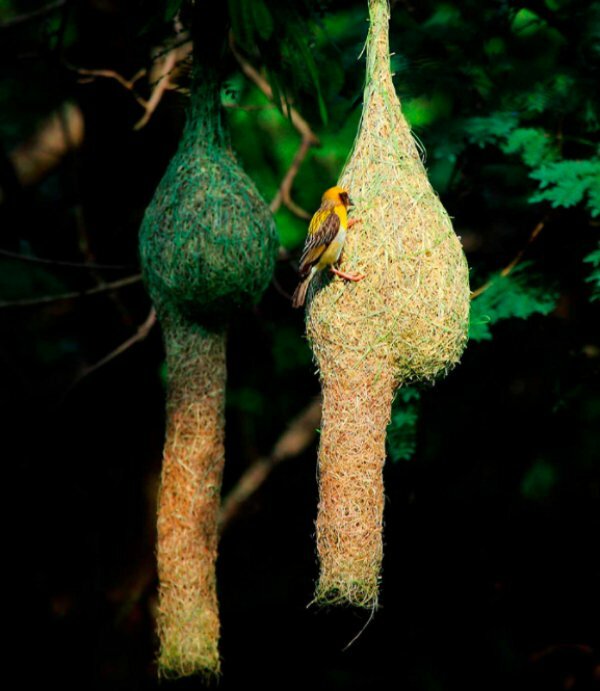 But these fancy dwellings are exclusively bachelor pads — once they find a mate, they move out. 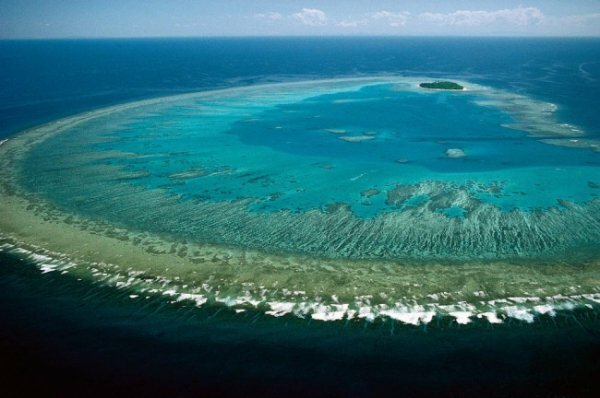 The Great Barrier Reef: The reef was a collaborative effort from underwater organisms that’s over 400,000 years in the making. 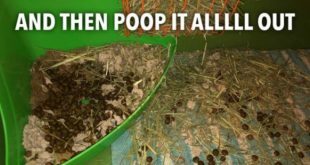 It covers nearly 4 million square feet. 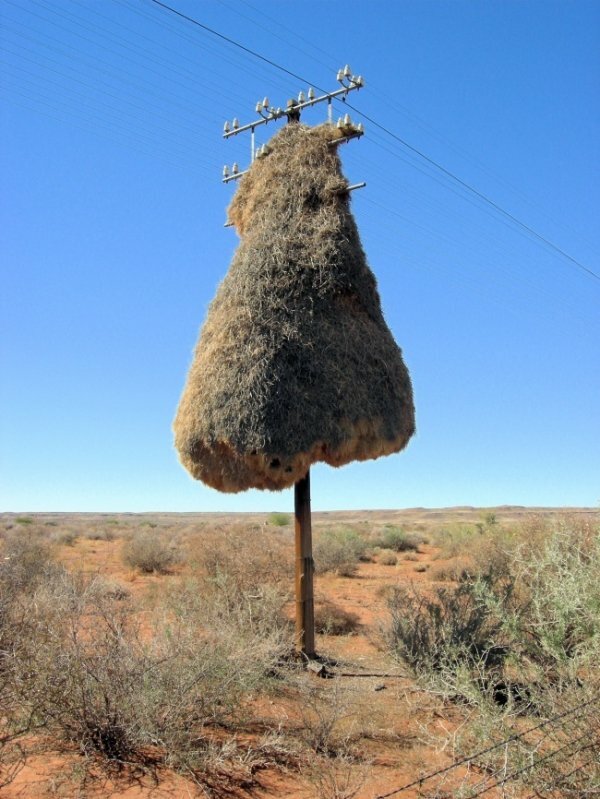 Baya weaver nests: Though made from only grass, the pear shape of the structures and drying from the sun give them surprising durability. 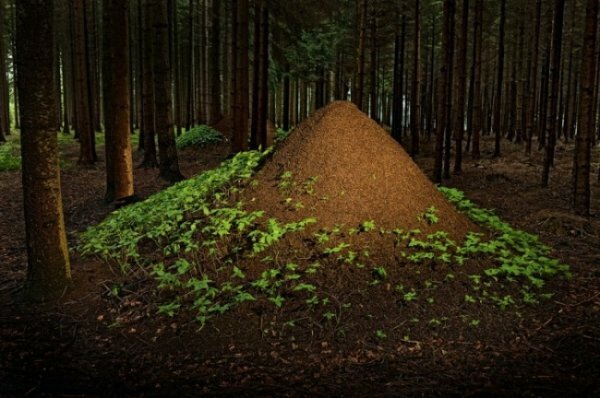 European Red Wood Ant Mounds: the ants’ ability to carry 20 times their bodyweight makes it possible to build these forest skyscrapers.